Here, to launch Today’s sabbatical, are my three extraordinarily smart and talented Albuquerque granddaughters. And the furry one’s quite beautiful as well. 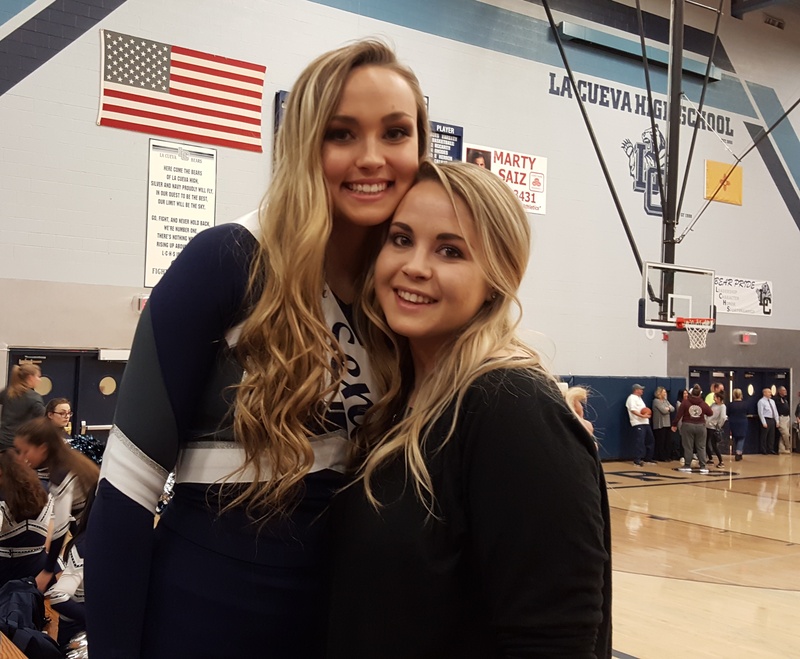 Sara and Patricia…life after Cheerleading is approaching for Sara. And here posing for her millionth photo is the Lovely Luna. Another sabbatical in my blog family. Today will sleep awhile—maybe until the days dwindle down to a wretched few of Chief Weasel Trump. Then Rip Van Winkle-like Today will rise again because every day will be a bright new adventure in progressive thinking. Yeah, right. If you’re having a really bad day you can scroll back a few months and see beautiful Luna at the dog park and in a mud bath and sitting on the couch eating yogurt with me. Posted on March 5, 2017, in Living LIFE. Bookmark the permalink. 2 Comments. Resist…resist…resist….and don’t forget to write. Your blogging public misses you when you don’t post…what is she up to? is she going to blog anything again? Is she on the Trans Siberian Express again? Take the Roadrunner to Santa Fe and go to the Georgia O’Keefe museum and be grateful she painted for us and we can get lost in her art and we can forget about you know who.